Full Vision Showcases have a 26” high glass display area on top of a recessed classic wooden base that adds to the decor of your store. Full Vision Showcases are perfect for displaying a wide range of items because they have accommodating display space and a very handy storage option. The base on a standard case comes closed. The overall dimensions of a standard Full Vision showcase are 38” high and 20” deep, with 4 different lengths available. The glass case is 26” high and 20” deep. The recessed wood base is 8” high and 17.5” deep. The black kick base is 4” high. 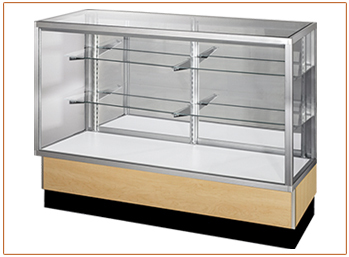 Full Vision showcases have one row 8” deep and one row 10” deep glass shelving. The 36” and 48” showcases come with one shelf per row; the 60” and 70” showcases come with two shelves per row.